Even though Vernon Rickman worked as a sculptor for the Smithsonian Institution for nearly 30 years, he also created more than 300 oil paintings, numerous sculptures, and hundreds of charcoal drawings in his spare time and during his retirement years in Newton. “He was a Kansan, and he was an artist through and through to the very center of his soul,” said his nephew Ted Scott. 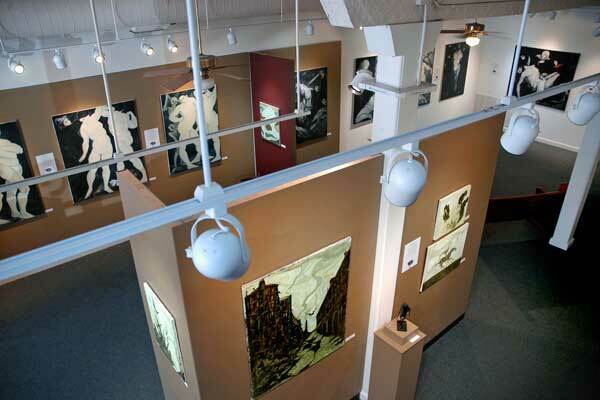 A selection of Vernon Rickman’s reliefs and paintings depicting his various styles — figural, religious, landscape and abstract — are on display at Carriage Factory Art Gallery, 128 E. Sixth St., Newton. The exhibit is part of an oral history project on Rickman’s life. Funding for this program is provided by the Kansas Humanities Council, a nonprofit cultural organization that connects communities with history, traditions and ideas to strengthen civic life. Rickman attended Newton High School, where he studied under art instructor Marie Orr. He pursued art studies in Kansas City and Cleveland, Ohio, before serving in the Korean War. After graduating from the University of Kansas with a degree in fine arts, he joined the Smithsonian as staff artist and sculptor. He worked on major projects still to be seen at the Smithsonian such as the Ice Age Exhibit in the Museum of Natural History. He sculpted likenesses of the First Ladies, still on display at the Museum of American History. Vernon’s words reveal the sense of humor family members recall. The fact that he worked as he talked fits with the description I heard again and again of him being very quiet. Another quality that came out in interviews and letters was Vernon’s devotion to his family. While working at the Smithsonian, Vernon would come back to Kansas at least every October to visit and to watch the World Series with his brother Keith. Sometimes he would head his Mustang west to California to visit his sister and his parents who eventually moved there. A letter to his brother Keith in 1965 reveals his frame of mind at that time: “… the thought of Mama isolated in that desert doesn’t set so well with me. I keep visualizing Mama walking up that long path alone, shrouded with age, detached from reality. The true reality that is life and dying all the time and this aloneness is the summation and payment for seventy years of toil. Life is hard and so is death but each has its own reward.” By 1970, he is tiring of work and shares with his brother: “I, too, am a little tired of my job and the city and etc. And wish to do my own work. When I do act I hope it will be from sound judgement and true conviction. One grows old very fast. Time is our ally and executioner. The axe waits but we mustn’t.” Years earlier he had considered working for Disney but decided to stay with the Smithsonian. As to his subject matter, his family sees echoes of the farm in Sylvia, Kansas, the family had for a while in some of his landscapes. His letters to his brother reveal an awareness of the political scene. In 1969, he wrote, “Washington, as you probably hear in the news, is getting to be an extremely dangerous city these days for black and white. The white man cannot even comprehend the monster he has created, but it (is) alive and it is devouring all sanity—all it knows is violence.” His nephew Ted Scott noticed trees were prominent in many of his paintings and asked him “Why do you paint your trees like you paint your trees?” Vernon replied, “Anybody can paint a pretty tree.” Ted realized, “It was obvious to me that he wanted to do his own thing.” Ted remembers seeing a sketch of a silo done by his uncle. “Free-drawn, and it’s just perfect. Some people just see the world differently…and he purposefully distorted his artwork…to his own style. He could have drawn it perfectly.” The samples Vernon submitted to the Smithsonian with his application for employment in 1958 bear this out. Each is detailed and finely done, although one featuring a large skull hints at the work he might have been doing at home. Buller’s interviews will be preserved and shared in the Newton community and throughout the state, with recordings and transcripts to be archived at the Harvey County Historical Museum and the Kansas State Historical Society. The public is invited to the opening reception on Saturday, July 9, beginning at 7 p.m. Buller will provide an overview of the life of Vernon Rickman. Rickman’s nephews, Ted and Michael Scott, will share memories of their uncle. Music will be provided by Vada Snider on flute, Ellen Neufeld on oboe, and Heidi Regier Kreider on piano. The event is free. 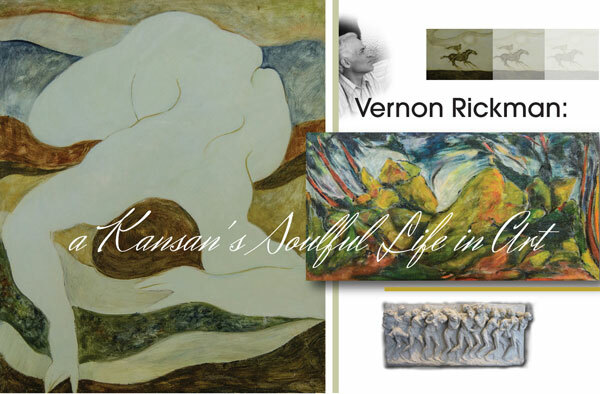 For more information about the Vernon Rickman exhibit/oral history project, call the gallery at 316-284-2749. Vernon Rickman at work at the Smithsonian. 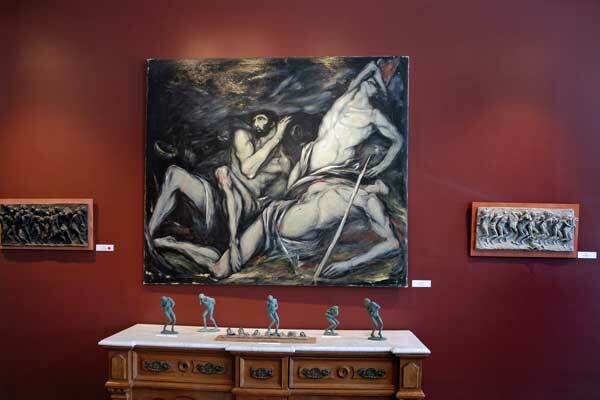 A large body of his personal work — paintings and reliefs — will be on display and for sale at Carriage Factory Art Gallery, 128 E. Sixth St., Newton. (photo courtesy of the Smithsonian Institution Archives).